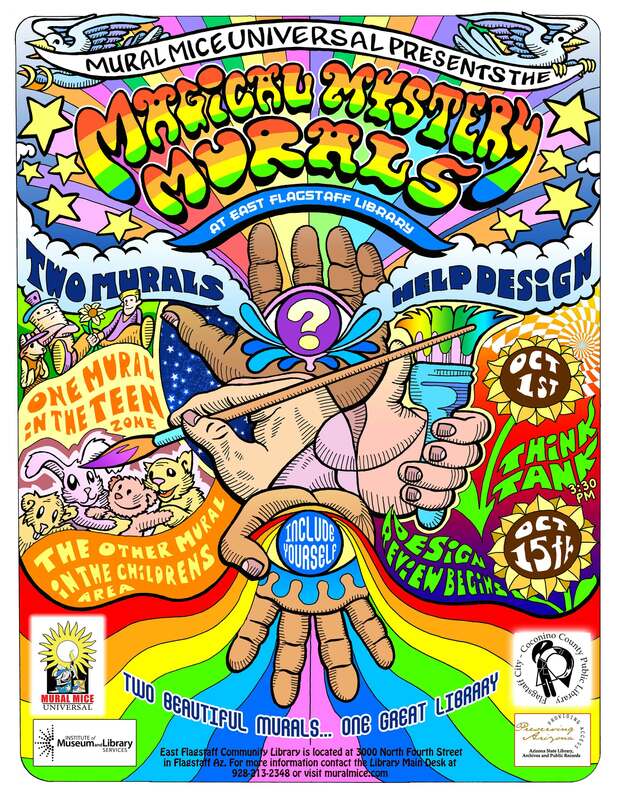 The East Flagstaff Community Library (EFCL) and Mural Mice Universal are pleased to announce the “Magical Mystery Mural Project.” Two murals will be placed in the newly renovated Children’s Area and Teen Zone at EFCL. 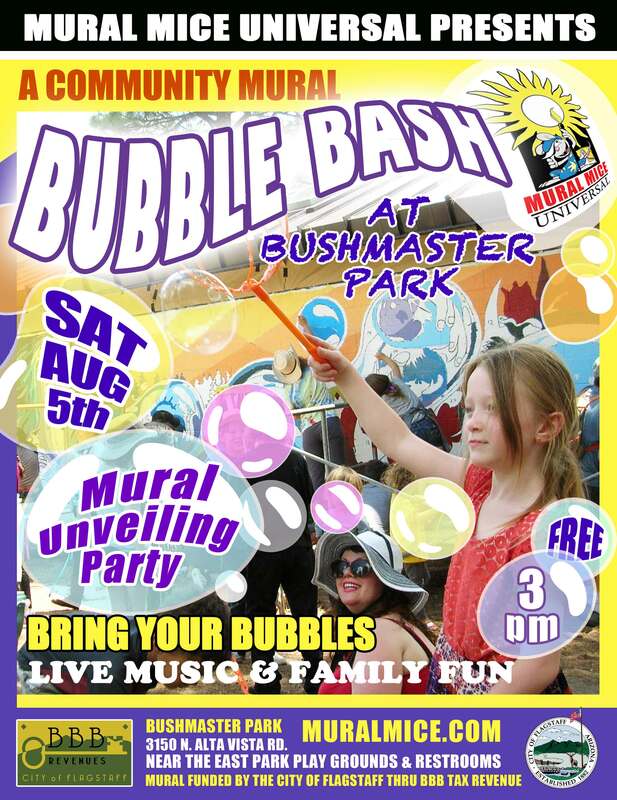 Teens and community members are encouraged to participate in the conceptualization of the murals this Fall. Viola Award winning Mural Mice artists R.E. Wall and Margaret Dewar will lead a small team of youth through the painting process in November. After two years, the “Sound of Flight” mural on the east side of the Orpheum Theater in downtown Flagstaff is complete. The artists are throwing a grand Dedication Celebration on Saturday November 7th, from 2-5pm. For the artists, this final event more than marks the completion of their efforts, it’s a chance to thank everyone who has contributed to, supported and appreciated the project as it took form during the past two years. “The project could not have been possible without the generosity of the Flagstaff community,” said Black. 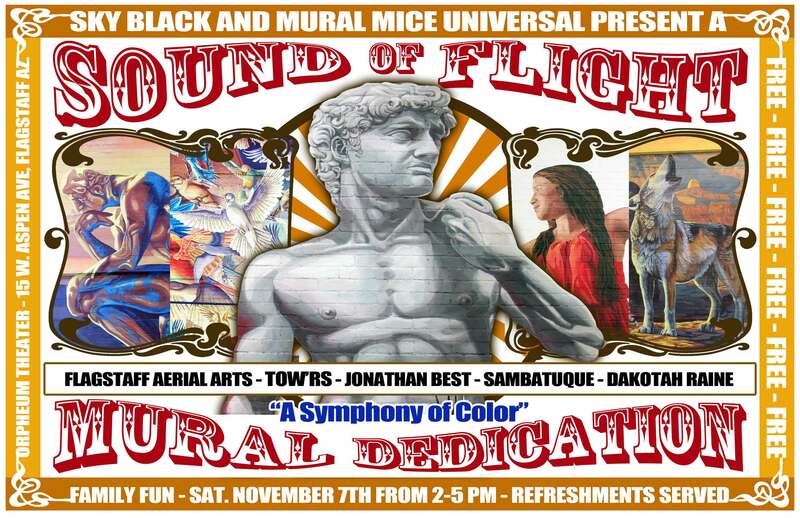 The artists invite one and all to this free and final Dedication Celebration for the “Sound of Flight” mural. 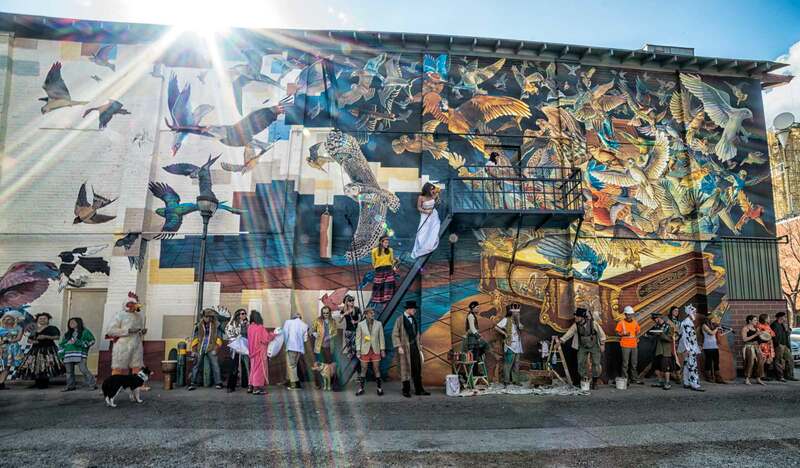 The Second Phase of our 2015 Sound of Flight mural project is in full motion. 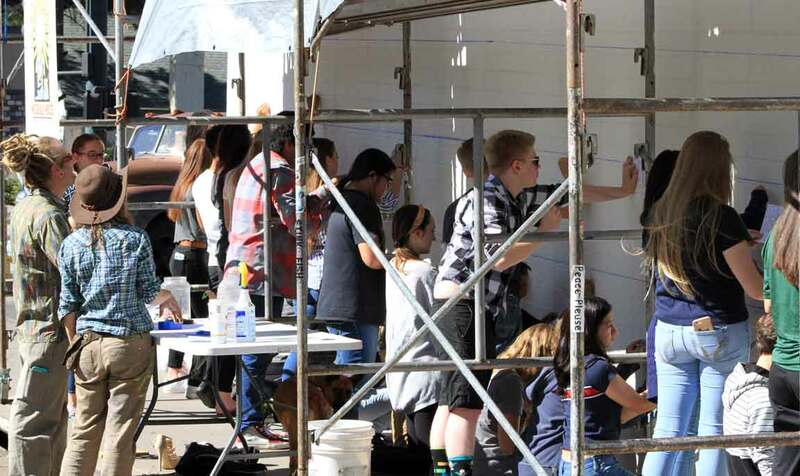 The Mural Mice are currently teamed up with artist Sky Black to paint the largest mural in Northern Arizona on the Orpheum Theater in downtown Flagstaff. It all began in April 2015, when project artists Margaret Dewar, R.E. Wall and Sky Black took to the streets on a mission to raise $40,000 in two months. 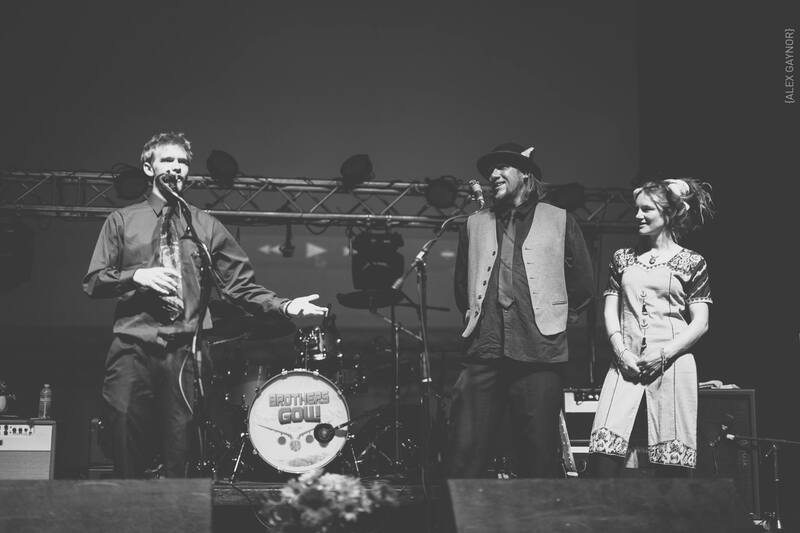 Their grassroots effort included; tabling at First Friday and Farmers Market events, a sponsorship drive that brought in close to two dozen new sponsors, an on-line Crowd Share campaign that successfully raised $15,000, and a benefit concert. 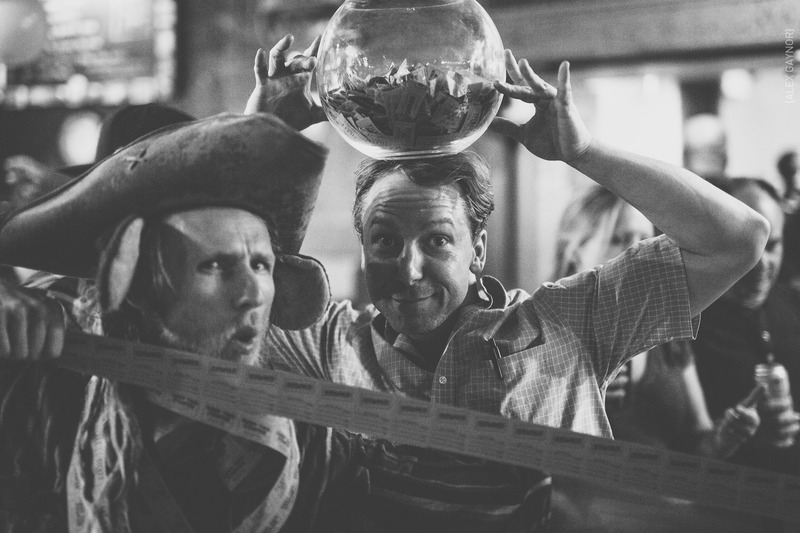 All told, the fundraising campaign is close to a complete success. There is just one grant proposal to the Flagstaff Art Council yet to be considered in the equation, and we’re good-to-go. Painting on the second half of the mural will begin in mid July and the completed mural will be celebrated in the Fall. Stay tuned for more updates and thank you for supporting this amazing project. The dramatic burst of birds pouring out of the grand piano on Aspen Ave has by now caught the attention of most Flagstaff residents. However, the mural on the side of the Orpheum Theater titled “Sound of Flight,” is only half complete. 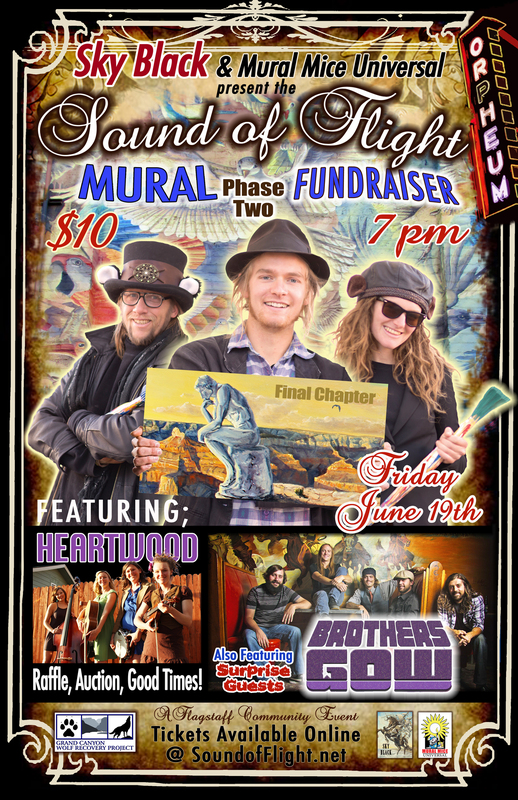 In order to fund the final phase of the project, the muralists invite the community to a benefit event at the Orpheum on Friday June 19th. Flagstaff’s own Brothers Gow will headline the event. Doors open at 7pm for an evening of food, raffle prizes, music by all-girl ensemble, Heartwood, and a special appearance by Sambatuque Drum Ensemble. 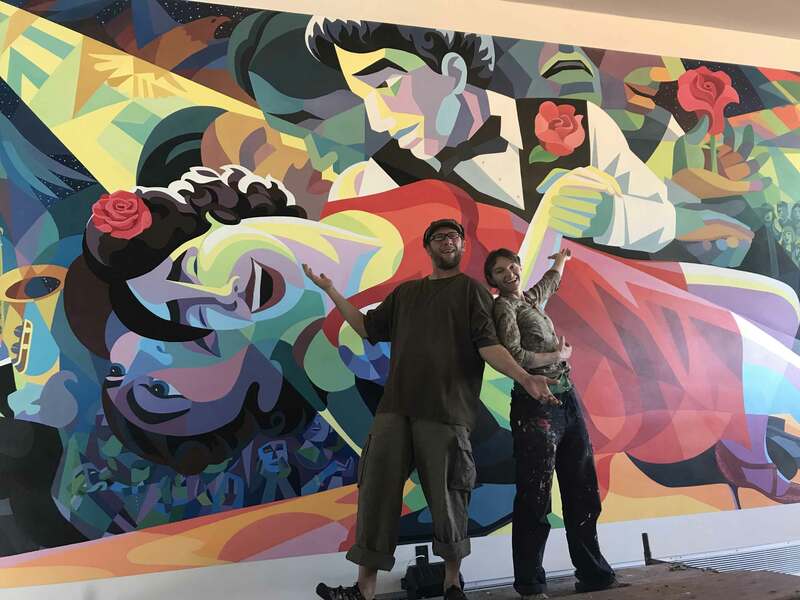 Last year, the artists spent six months painting the first half of the enormous 4500 square foot wall of the historic Orpheum Theater. Sky Black, visionary for the project designed the piece. He recruited veteran muralists, R.E. Wall and Margaret Dewar, known as the Mural Mice, to bring his idea to light. The mural benefit is the final push to launch the second season of painting. “So far the community has been extremely generous toward the effort,” said Sky Black. Funding for the mural has come from over 60 local businesses, grants, and from hundreds of individuals in the community. “Public art belongs to everyone, the ‘Sound of Flight’ mural will be a Flagstaff landmark and point of pride for years to come,” explained R.E. Wall. The image for the second half of the mural can be viewed online at SoundofFlight.net. The artists have an ongoing crowdfunding campaign at the website as well with perks available to everyone who donates to the project. Tickets are available at SoundofFlight.net.